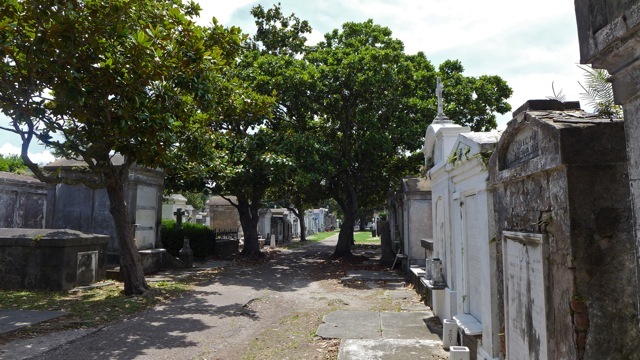 Just a couple short blocks north and east of Ted's birthplace is Lafayette Cemetery No. 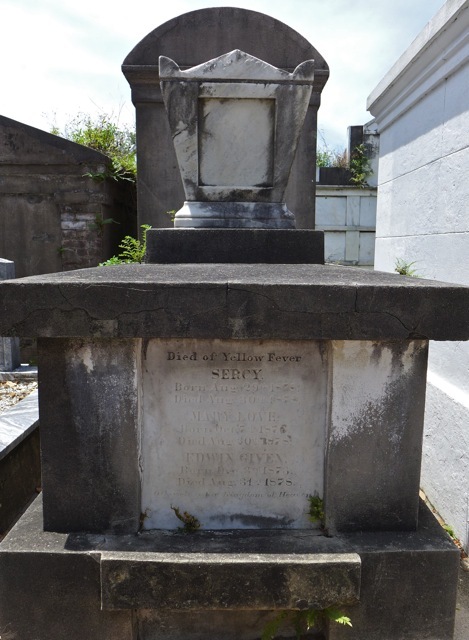 1., built in 1833 and the oldest of seven municipal cemeteries in New Orleans. Surrounding the cemetery is a wall and a wrought iron entry gate. The surrounding walls have vaults built into them, most of them unmarked. 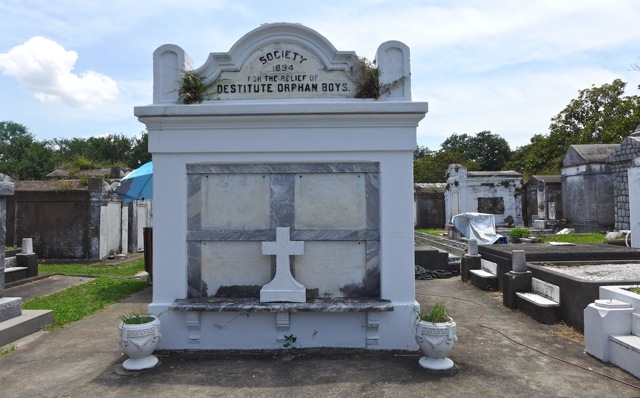 There are about 500 vaults at Lafayette Cemetery No. 1. The cemetery is laid out in 4 quadrants created by two intersecting paths that form a cross. Trees line the paths, providing shade and a garden-like atmosphere. Many of the people buried here have German or Irish names, and from the dates you can see the devastating toll that yellow fever took on immigrants in the early 19th century. Whole families have been laid to rest in these plots. Some of the more elaborate marble contructs were built by wealthy families or are the final resting home for fraternal orders and their families, like the Jefferson Fire Company and the Society for the Relief of Destitute Orphan Boys. You might wonder how entire families share the same plot. 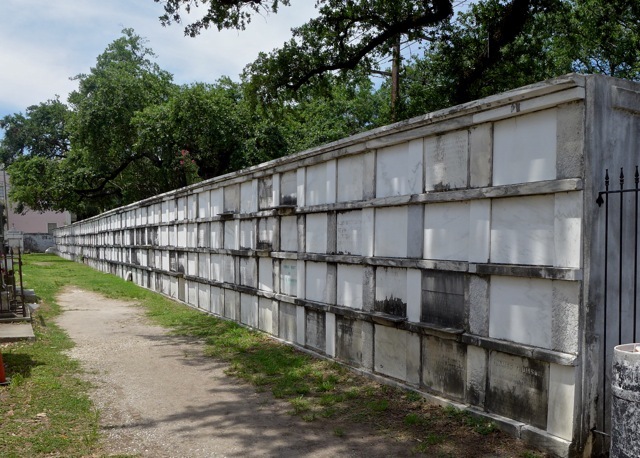 In New Orleans, the dead are placed in coffins which are then placed in the vault. They rest there for at least a year and a day before another person can be entombed there. Why? 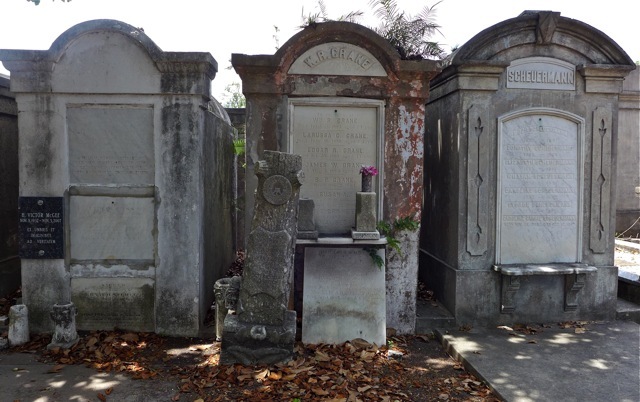 Because in a year and a day, with a casket inside these tombs, the heat and humidity of New Orleans bakes the bodies, reducing them to ash and bone. Temperatures inside the tombs can reach 300 degrees Fahrenheit. Some pieces of wood may remain after this time (they are removed and disposed of), but the bodies are swept to the back of the tomb, where their ashes join those of their ancestors. 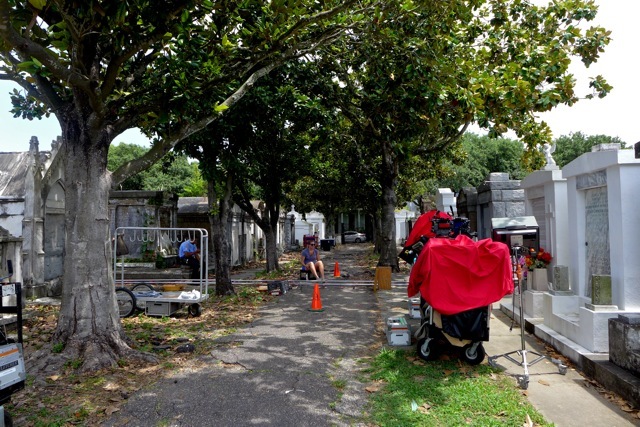 High water tables force New Orleans to bury their dead in this way, because graves cannot be dug deep enough to keep caskets from popping out of the ground during heavy rain or floods. 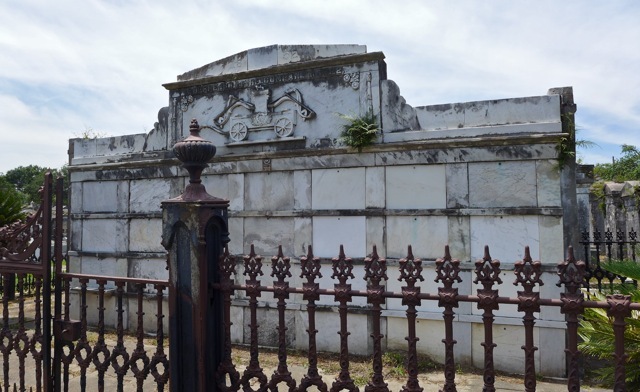 New Orleans is sinking at a slow rate every day, so tombs must be above ground in a more permanent structure. You might also wonder why the cemetery is walled so high. In the past, before people figured out how to properly bury the dead, walls had to be built to contain all the coffins when they did pop out of the ground. A frightening thought, to see caskets floating down the street after a rainstorm! Ted asks that you please be respectful when you visit these old cemeteries. The tombs are old and crumbling, but people today still use them. 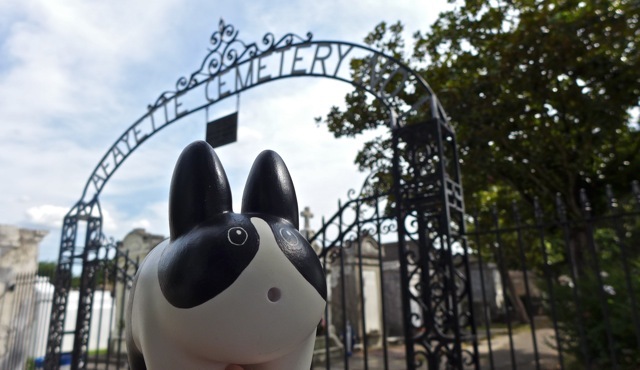 He recommends a tour of this and other cemeteries so you can learn more about these "Cities of the Dead" and some of the notable figures buried there.